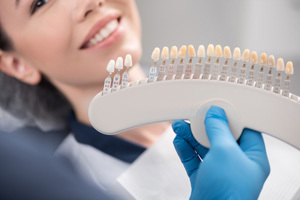 Teeth whitening is one of the most popular procedures in cosmetic dentistry because it offers dramatic improvement to the smile with only a minimal investment of time or money. The treatment can be used alone or as part of a Smile Makeover. It’s also ideal for jump-starting an over-the-counter regimen. We also offer touch-up kits to use after your initial teeth whitening treatment to ensure long-lasting results. Just ask! Be sure to browse our New Smile Portraits to see our before and after success stories! We’ve carefully selected our professional bleaching brands to maximize your results and minimize tooth sensitivity and side effects.